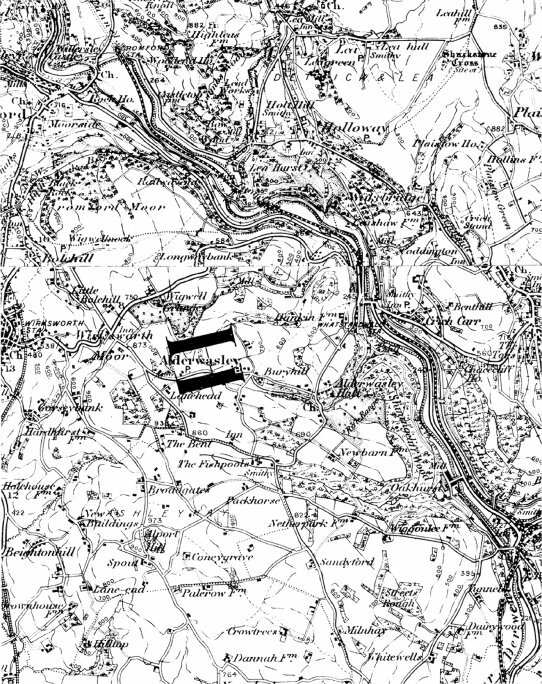 Here's an 1897 map centred on Alderwasley just East of Wirksworth, published with permission from Michael Bruff of Hamden Maps, and is part of The Village Atlas series. To limit download time, the resolution has been reduced from 1200 to 72 dpi, there's far more detail on the original. The Village Atlas is a series of composites of historical ordnance survey maps reproduced at a scale of 2" to the mile. They cover five areas -- London, Birmingham and the West Midlands, Derby, Leicester and Nottingham, Leeds, Sheffield, and York, and Lancashire and North Cheshire. Each Atlas covers an area of approximately 1500 square miles, divided into 50-square mile blocks. Three maps for each block, printed on consecutive double-page spreads, allow the reader to study the changes which took place within the area covered at the turn of a page.